The ONE GOD Book is accessible from any Internet enabled mobile device or computer. The ONE GOD Book Concordance is accessible only from Internet enabled computers and some mobile devices because it uses frames, and many browsers found on mobile devices do not support frames. ONE GOD Book and ONE GOD Book Concordance were developed anonymously in thanksgiving to the ONE GOD after the developer was granted a medical miracle. The inspiration for publishing the core texts of monotheism accessible freely and globally to those in extremis via a handheld device was received while the developer faced the prospect of death in a hospital critical care unit. If you have questions about what you read or learn in the ONE GOD Book you can study the ONE GOD Book at ONE GOD Book Study www.study.ONEGODBook.com or you can contact a trained cleric of the Jewish (Tanakh), Taoist (Tao Te Ching), Vaishnava Hindu (Bhagavad Gita), Christian (New Testament) or Muslim (Qur'an) Faiths for guidance as per your preference. The ONE GOD Book Seal at the top of this page contains the revealed Being Names from the five, chronologically ordered, texts of the ONE GOD Book written on the seal in the modern alphabet of the language in which the Names were first spoken on earth. 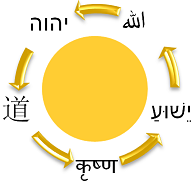 From top-left, counterclockwise, the English transcription of the Names follows: Yahweh, Tao, Krishna, Jesus, and Allah. The cyclical, counter-clockwise spinning arrows indicate timelessness. At the center of the seal is a simple depiction of the sun. The sun is NOT the ONE GOD; however, the sun is the energy source within the sensory perception of all humans that has some quantum mechanical properties of the ONE GOD. Unlike the revealed Beings, which are earthly manifestations of the ONE GOD, the ONE GOD is outside the space-time continuum and cognitively incomprehensible to the human brain. Although the ONE GOD has neither "form" nor "mode," the ONE GOD is accessible to human experience through the longstanding contemplative traditions of Judaism, Taoism, Vaishnava Hinduism, Christianity, and Islam. "abstain" from stimulants, including caffeine and nicotine, and "intoxicants," including alcohol while "avoiding" "gambling." Instead, "practice" "prayer" with "meditation" and "virtue" with "charity," "chastity," "discipline," "diligence," "humility," "kindness," "patience," and "tolerance." A simple but effective form of meditative prayer is the repetitive "speaking" synchronized with the breathing cycle of either Unus Deus, the Latin term for "ONE GOD" or the "Name" of a Revealed Being: Yahweh, Tao, Krishna, Jesus, or Allah. "Love" of "neighbour" and "fear" of ONE GOD are the "doorways" to "understanding." In scientific terms, ONEGODness is macroscopic quantum entanglement between the electromagnetic field of the human brain and the ONE GOD. ONEGODism : Study of the art and science of ONE GOD worship. ONEGODist : Studier of the art and science of ONE GOD worship.